For other uses, see Joint (disambiguation). A joint or articulation (or articular surface) is the connection made between bones in the body which link the skeletal system into a functional whole. They are constructed to allow for different degrees and types of movement. Some joints, such as the knee, elbow, and shoulder, are self-lubricating, almost frictionless, and are able to withstand compression and maintain heavy loads while still executing smooth and precise movements. Other joints such as sutures between the bones of the skull permit very little movement (only during birth) in order to protect the brain and the sense organs. The connection between a tooth and the jawbone is also called a joint, and is described as a fibrous joint known as a gomphosis. Joints are classified both structurally and functionally. Types of joints based upon their structure (L to R): Cartilaginous joint, Fibrous joint, and Synovial joint. cartilaginous joint – joined by cartilage. There are two types: primary cartilaginous joints composed of hyaline cartilage, and secondary cartilaginous joints composed of hyaline cartilage covering the articular surfaces of the involved bones with fibrocartilage connecting them. synovial joint – not directly joined – the bones have a synovial cavity and are united by the dense irregular connective tissue that forms the articular capsule that is normally associated with accessory ligaments. facet joint – joint between two articular processes between two vertebrae. Joints can also be classified functionally according to the type and degree of movement they allow: Joint movements are described with reference to the basic anatomical planes. synarthrosis – permits little or no mobility. Most synarthrosis joints are fibrous joints (e.g., skull sutures). amphiarthrosis – permits slight mobility. Most amphiarthrosis joints are cartilaginous joints (e.g., intervertebral discs). synovial joint (also known as a diarthrosis) – freely movable. Synovial joints can in turn be classified into six groups according to the type of movement they allow: plane joint, ball and socket joint, hinge joint, pivot joint, condyloid joint and saddle joint. Joints can also be classified, according to the number of axes of movement they allow, into nonaxial (gliding, as between the proximal ends of the ulna and radius), monoaxial (uniaxial), biaxial and multiaxial. Another classification is according to the degrees of freedom allowed, and distinguished between joints with one, two or three degrees of freedom. A further classification is according to the number and shapes of the articular surfaces: flat, concave and convex surfaces. Types of articular surfaces include trochlear surfaces. Unmyelinated nerve fibers are abundant in joint capsules and ligaments as well as in the outer part of intraarticular menisci. These nerve fibers are responsible for pain perception when a joint is strained. Damaging the cartilage of joints (articular cartilage) or the bones and muscles that stabilize the joints can lead to joint dislocations and osteoarthritis. Swimming is a great way to exercise the joints with minimal damage. A joint disorder is termed arthropathy, and when involving inflammation of one or more joints the disorder is called arthritis. Most joint disorders involve arthritis, but joint damage by external physical trauma is typically not termed arthritis. Arthropathies are called polyarticular (multiarticular) when involving many joints and monoarticular when involving only a single joint. Arthritis is the leading cause of disability in people over the age of 55. There are many different forms of arthritis, each of which has a different cause. The most common form of arthritis, osteoarthritis (also known as degenerative joint disease), occurs following trauma to the joint, following an infection of the joint or simply as a result of aging and the deterioration of articular cartilage. Furthermore, there is emerging evidence that abnormal anatomy may contribute to early development of osteoarthritis. Other forms of arthritis are rheumatoid arthritis and psoriatic arthritis, which are autoimmune diseases in which the body is attacking itself. Septic arthritis is caused by joint infection. Gouty arthritis is caused by deposition of uric acid crystals in the joint that results in subsequent inflammation. Additionally, there is a less common form of gout that is caused by the formation of rhomboidal-shaped crystals of calcium pyrophosphate. This form of gout is known as pseudogout. Temporomandibular joint syndrome (TMJ) involves the jaw joints and can cause facial pain, clicking sounds in the jaw, or limitation of jaw movement, to name a few symptoms. It is caused by psychological tension and misalignment of the jaw (malocclusion), and may be affecting as many as 75 million Americans. The English word joint is a past participle of the verb join, and can be read as joined. Joint is derived from Latin iunctus, past participle of the Latin verb iungere, join together, unite, connect, attach. The English term articulation is derived from Latin articulatio. Humans have also developed lighter, more fragile joint bones over time due to the decrease in physical activity compared to thousands of years ago. ^ "Articulation definition". eMedicine Dictionary. 30 October 2013. Retrieved 18 November 2013. 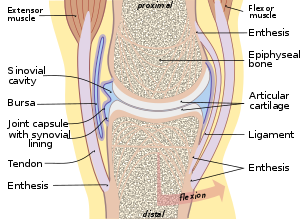 ^ "Introduction to Joints (3) – Joints – Classification by Tissue Joining Bones". anatomy.med.umich.edu. Archived from the original on 2011-06-08. Retrieved 2008-01-29. ^ "Articular Facet". Medilexicon – Medical Dictionary. Retrieved December 19, 2013. ^ "Foundational Model of Anatomy". Archived from the original on December 19, 2013. Retrieved December 19, 2013. ^ a b "Introduction to Joints (2) – Joints – Classification by Movement". anatomy.med.umich.edu. Archived from the original on 2011-07-18. Retrieved 2012-10-06. ^ "Introductory Anatomy: Joints". Retrieved 2008-01-29. ^ "Clinical Neuroanatomy and Neuroscience - 6th Edition". www.elsevier.com. Retrieved 2019-03-17. ^ a b c Klein, E. (1971). A comprehensive etymological dictionary of the English language. Dealing with the origin of words and their sense development thus illustration the history of civilization and culture. Amsterdam: Elsevier Science B.V.
^ Lewis, C.T. & Short, C. (1879). A Latin dictionary founded on Andrews' edition of Freund's Latin dictionary. Oxford: Clarendon Press. ^ Thompson, Helen. "Switching to Farming Made Human Joint Bones Lighter". Smithsonian Magazine. Smithsonian, 22 December 2014. Retrieved 28 November 2016. Wikimedia Commons has media related to joints.